As Tasmania battles bushfires and one of the driest and hottest Januarys on record, IMAS PhD student Megan Grant has been experiencing snow at the other end of the planet while undertaking a research fellowship in Thurso, on the far north coast of Scotland. “I left Tasmania on Monday 14th January and it took me over 45 hours to get here,” she said. “Thurso is the northern-most town on the UK mainland, and after flying to London and then to Inverness I still had a 4-hour train journey to get here. Ms Grant is in Thurso on a newly created fellowship awarded by the Association of Commonwealth Universities (ACU) and funded by the UK Government to support research and innovation in marine plastics. “The fellowships provide 35 PhD and early career researchers with two to three month placements at ACU member universities in a country other than their own. “In 2017 I did honours at IMAS, studying the incorporation of plastic in Brown Booby (Sula leucogaster) nests at 18 sites around the world as part of the Adrift Lab, and I decided to stay on and undertake a PhD researching marine plastic pollution and the impacts on seabirds. “While here, I’m working on developing a standardized methodology for quantifying the level of plastic and other anthropogenic debris within Northern Gannet (Morus bassanus) nests. “Northern Gannets are from the same family as Brown Boobies but their nests are nothing alike. “Gannets build nests over multiple years and incorporate mostly rope and netting. “The nests are complex, and at first glance it seems like an impossible task to calculate how much debris has been used. “Rather than counting the exact quantity of debris, I’ll be using photographs of gannet colonies taken by researchers and citizen scientists and exploring image recognition and image processing software to identify the most efficient approach for extracting data and determining the proportion of debris within nests. “This will give us an indication of the severity of the issue at each individual nest and at the colony overall. “Comparisons between colonies can then be made and colonies at risk can be identified which will help direct and focus future monitoring efforts. 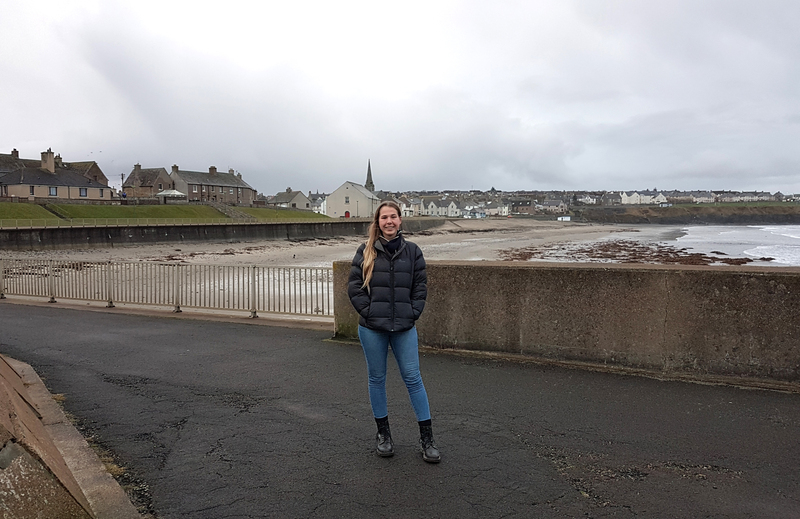 “My time here in Thurso concludes at the end of March and I hope to have made significant progress on a methods paper prior to my departure, and while I’m here I’ll also be taking part in the Commonwealth Blue Charter Capacity Audit, which aims to map the current status of marine plastic research across Commonwealth countries. “Once I get home I’ll be applying for the Ocean Plastic Conference held in Melbourne in December 2019 so I can present the findings of my research undertaken here in Thurso,” she said.